Westonbirt The National Arboretum is located in Gloucestershire, and provides an historic and picturesque setting for an internationally important tree and shrub collection. Managed by the Forestry Commission, there are around 15,000 specimens from all around the world for people to enjoy and learn about trees. 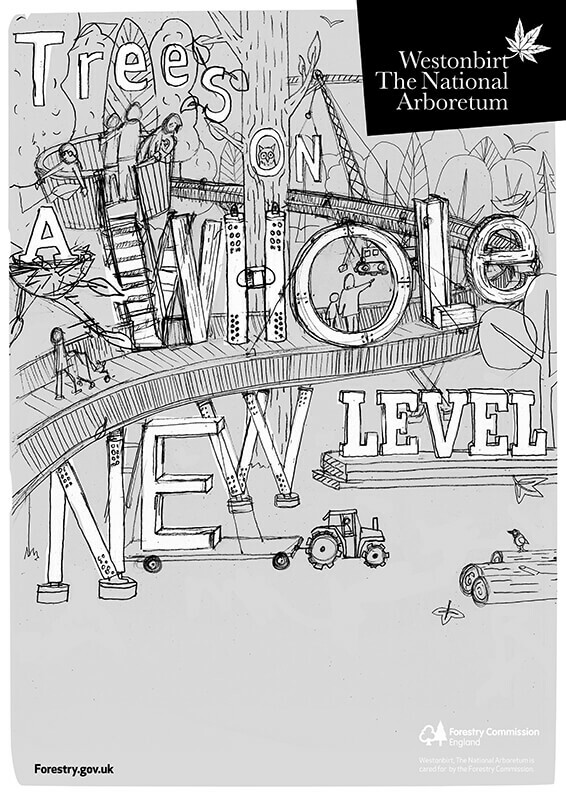 To work with The Way Design and create an illustration for a campaign they were developing to publicise the opening of the new STIHL Treetop Walkway. The walkway which offers spectacular views across the arboretum landscape and is step-free, making it accessible for all - It is 300m long and gradually rises on gentle inclines to a height of 13 metres. The campaign was to be based on the idea of 'Trees on a Whole New Level.' I was asked to produce two initial sketches, each incorporating illustrated typography. The first with the strapline integral to an illustration of the walkway and the second with an alternative strapline and some number facts. The walkway was still being built when we were developing the campaign, so I just had an architect's visual and some images of the build progress as reference. Why did you approach Carys to work with you on this project, what expertise did you hope she would bring? We were looking for an illustrator to work with us on this campaign which we’d already won. We liked her style and she had relevant experience so we asked her to get involved. How did you find the process? From the initial briefing through to the completion of your project. Carys is a good communicator who always kept us in the loop with developments and responded to amends calmly and diligently. She did push back on a couple of points, explaining why, which I think the client appreciated and better understood as a result. She explained the process clearly so we knew where we were as we hadn’t commissioned illustrators for specific projects previously. We’re really pleased, and so is the client! The end result is better than we envisaged, a visual treat. If you had to describe Carys to a colleague, what would you say? Great illustrator and easy to work with. Honest and approachable. Pictured below: Some images from the Westonbirt website of the completed walkway. It officially opened on April 27th, 2016 - I'm looking forward to making a visit!